I’m able to use this particular image as CDM is itself under a Share Alike license. Photo (CC-BY-SA) Andy Melton. Latest case in point: the CBC. The issue with our use of Creative Commons music is that a lot of our content is readily available on a multitude of platforms, some of which are deemed to be “commercial” in nature (e.g. streaming with pre-roll ads, or pay for download on iTunes) and currently the vast majority of the music available under a Creative Commons license prohibits commercial use. That seems to me to sum up the story: whatever the wisdom of CBC’s solution, this is a failure of the non-commercial restriction. And that should hardly come as news to anyone who has followed the problems with “NC.” It’s a Saturday, so consider this a hastily-devised rant rather than a fully-researched story. But I’d like to see a more productive conversation start on this whole issue, so I’ll kick it off by sharing my own thoughts on this. Here’s the problem. 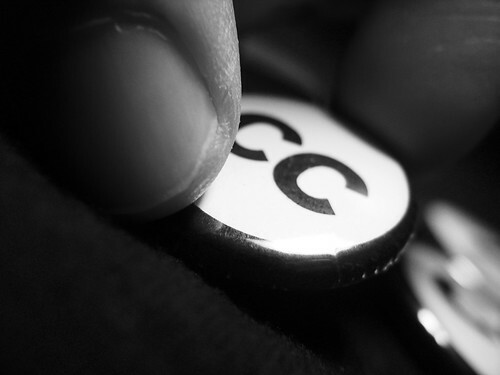 The whole idea of Creative Commons licensing is to provide a blanket license before someone has to ask permission. By streamlining the process in this way, the goal is to get wider distribution and reuse of your work. And as everything from samples to Flickr images can demonstrate, it works. Now, naturally, wide distribution will also raise fears about commercial exploitation, and as with any license, you’re the owner – you can provide whatever restrictions you like. People want to share, but they don’t want that sharing to be abused. I think the impulse to look for some sort of “some rights reserved” is a natural one. Unfortunately, using non-commercial restrictions as the solution can create more problems. The non-commercial rules are vaguely worded, implying a very broad definition. It’s never properly defined, and no one really knows what it means. The net result is that works with the restriction attached aren’t free for use. You have to err on the side of caution; if you think there’s any chance you may be violating the license, you shouldn’t use the work. That’s the crossroads I reached on this very site. Chris Randall of Audio Damage and Analog Industries, who has released a significant amount of CC-licensed music, pointed out to me that CDM was blatantly violating the intent of the non-commercial restriction. Sure enough, I came to the same conclusion, as a survey undertaken by the CC folks found that many of the people using the non-commercial restriction considered use on a site with advertising revenue to be commercial use. CDM readers and Flickr users protested. But it doesn’t matter: I now almost exclusively use works without it, to be safe. There is more to this story, though. CBC ought to be able to use CC music. CBC is clearly overreacting if they’re avoiding all CC-licensed work. There is work out there that lacks the non-commercial use restriction. 3. A number of potential remedies — of which adding a “non-commercial” CC license is only one, and possibly not even an ample remedy for the kind of exploitation people want to prevent. It’s time to clean up that mess and remedy the problem. Unlike the description of non-commercial – there’s never actually a detailed description of what constitutes “commercial” use — Share Alike is very clear. Anyone using your work must license whatever work they make. Yes, this is an issue for open-source hardware, too. I won’t go there today, because hardware incorporates other issues. It’s tangible, and that means legal licensing is different. The problems of interpreting the definition of “commercial,” however, remain, and there’s a threat that open source hardware makers will recreate some of the problems with Creative Commons-licensed media in the hardware domain by modeling their work on the same license. Consider the can of worms opened, but I’ll deal with that in a separate story. Thanks to Myles Ashley Borins for the tip! (CDM, as a US publication, is unable to do so.) If someone would like to volunteer to do so, shout out in comments. I think it would be useful to know the formal policy and reasoning from CBC.